Oats are one of the most nutritious cereals that can be consumed in several forms. They are whole grain products high in starch and dietary fibre, low in fat, and concentrated in micronutrients including vitamins and minerals. Oats are a good source of soluble fiber called beta-glucan and a number of studies have shown that a diet which is low in fat and rich in soluble fibre can help reduce high blood cholesterol levels and thereby reduce the risk of heart disease. Oats have a low glycemic index which means they are absorbed into the blood stream slowly helping to keep blood sugar levels stable. In the processing of oats, the hulls are removed leaving the oat groat. Groats are then milled into steel-cut oats, rolled flakes, quick and instant flakes, oat flour, and oat bran as the case may be. 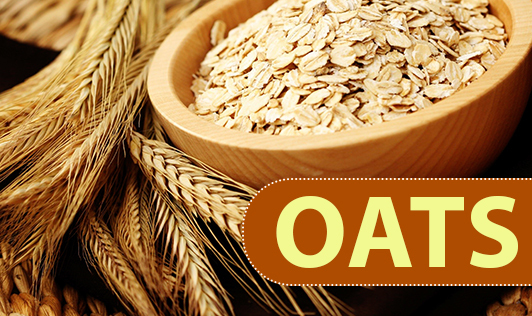 In North America, oatmeal means any crushed oats, rolled oats or cut oats used in recipes such as oatmeal cookies. The porridge made from this is also called oatmeal which is a traditional breakfast known for its fibre content. In other parts of the world, oatmeal means coarsely ground oats. Oat bran is derived from the outer layer of oat kernels by milling and is frequently added in the diet to increase fibre content which in turn helps to relieve constipation. With respect to its uses in the food industry, oats keep baked goods fresh longer due to its moisture retention properties. Oats contain little gluten so they need to be combined with high gluten grains such as wheat to make yeast bread. Oat flour is used in baby cereals and rolled oats are a major ingredient in granola cereals and bars which are a mixture of rolled oats, honey, nuts, raisins, or dates.